It doesn’t matter what you call them, they all do the same thing. A make bench is a cabinet that can have two or more doors in the cabinet section, but most importantly the Pizza prep fridge, Make Bench or Prep Bench in your catering facility will have food wells in the top section. These food wells are ideal for quick and instant access to those foods that are required for quick production of sandwiches and pizzas. 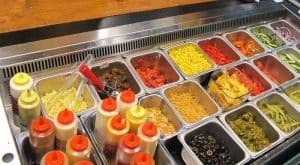 These food wells save the operator the nuisance of having to reach into the cabinet every time they wanted a bowl of toppings, which in turn keeps running costs down and keeps the ingredients fresher. 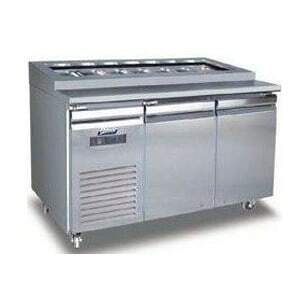 Depending on the design, the food wells are generally suspended in the cold air from the cabinet space below and some of the better designs also project cold air across the top of the food. This improvement has come about as health inspections were once finding that if certain foods sat for too long, that whilst the bottom was nice and cold, the food in the top would get too warm. I recommend that if you are looking to buy a Prep bench, Pizza Prep Fridge or Make Bench, that you look for these details. Separating the customer from the food prep area we usually find a sneeze guard, which is made of Perspex or glass. This item may not be required if the bench is up against a wall. We are also seeing a movement towards “push in units” that are housed in one end of the cabinet. 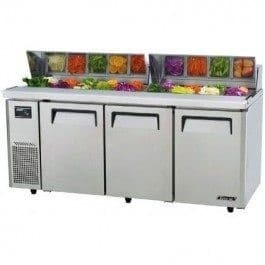 These Push in Units are a complete packaged system and when a problem arises, they entire unit can be removed from the cabinet, so it can be worked on out the back of the store and not inconvenience the busy kitchen staff. At Allen Air and Refrigeration, we know the importance that your Make bench, Pizza prep or Prep bench means to you. We also know how unfortunate it is to have us working around your feet when you are at your busiest times in your commercial catering kitchen. Let us develop a maintenance schedule with you that will reduce the chance of breakdowns at those peak time when you can ill afford them. We can attend site when you are at your quietest times. If need be we can remove the cassette or push in refrigerated unit and take it out to the van for repairs. We carry a range of spare parts that are commonly available for most Make benches. These are mainly fans and thermostats but what we don’t have in stock we can order in through our extensive network of parts suppliers. Occasionally we find certain products can only be sourced as an OEM part through the fridge manufacturer. These parts can include door seals, hinges and even of course complete doors.